Yogurt has always been associated with good health. Now demand is growing for a new kind of yogurt – the Greek variety. Sales more than doubled last year. And just as this market shift is healthy for consumers, it’s also good for dairy farmers. Fans of Greek yogurt say the thick, creamy yogurt fills them up with the right stuff. It has a lot more protein – double or even triple the amount that’s in conventional yogurt. That’s because Greek yogurt is made with a lot more milk. Tom Moffit is President of Commonwealth Dairy in Brattleboro. His plant makes yogurt for retail stores who want their own brand. Moffit said he’s getting as much as 45,000 gallons of milk delivered every day. "Part of the reason we are receiving so much as a yogurt maker is because we make a lot of Greek yogurt," Moffit said. "Greek yogurt takes about five times as much milk to make than conventional yogurt." Moffit said he’s making almost all Greek now. He leads the way up two flights of stairs to a catwalk that overlooks six stainless steel tanks each full of 8,000 gallons of skim milk that’s fermenting. That’s where the milk is cultured. But to become Greek yogurt it goes into a centrifuge that separates out the whey, the watery part of conventional yogurt. "That’s what makes the Greek yogurt so thick and smooth and creamy," he said. "You’re taking all the liquid out of it so we’re going to open this up and you can see fresh Greek yogurt that has just been made." But making such a rich yogurt requires much more milk than the conventional kind – two to five times as much. And Moffit says up until last month, when cows began producing more milk – as they do every spring – he couldn’t always get enough. "Milk has been a challenge for us," Moffit said. It has also been a challenge for other yogurt makers. 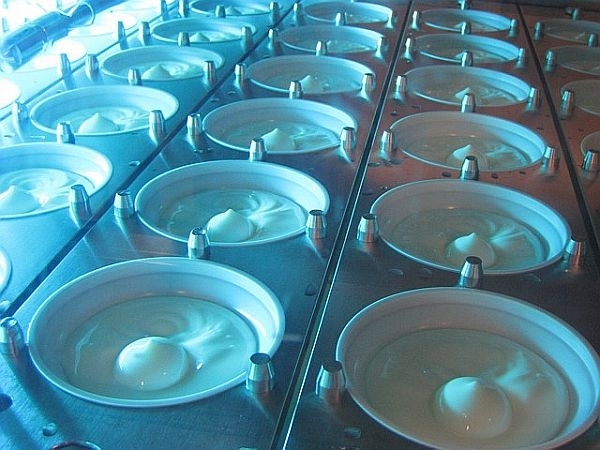 In New York state there are 29 yogurt plants, many of which make Greek yogurt. Pepsico says it’s opening a $206 million yogurt plant there. Moffit says that’s a big plant. "We’re really concerned about the long-term prospects in the northeast for milk supply," he said. "Its been a struggle for us. We expect over the next few years it will continue to be a struggle and I kind of scratch my head and wonder where all that milk is going to come from." 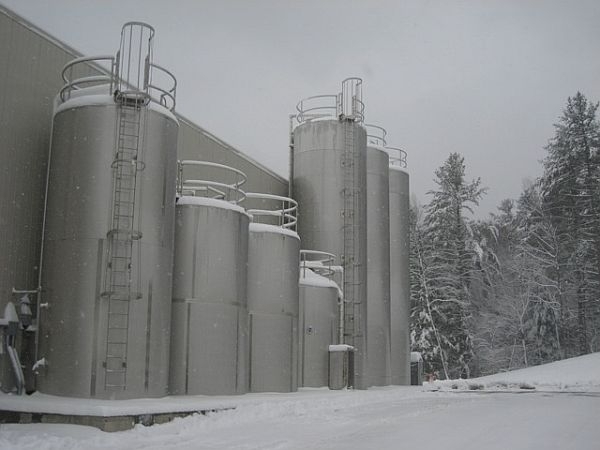 "Five years ago we didn’t know what we were going to do with all the milk and now with the yogurt plants coming on it’s been drying up the milk supply," said Robert Gilchrist, who markets fluid milk for Agrimark, one of the biggest milk-cooperatives in the region, with 1,200 farms. He said Agrimark couldn’t always deliver enough milk to yogurt makers when they wanted it last fall. "Not on the days that they wanted," Gilchrist said. "Most everybody got the milk that they needed, but they had to change their production schedules." Gilchrist said he expects the supply will be very tight again next fall. Diane Bothfeld, Vermont’s Deputy Secretary for Dairy Policy says this is good news. "I don’t think we’re concerned," Bothfeld said. "We’re excited. It’s a great opportunity for our farmers in the region." When it’s harder for yogurt makers to get milk, they’ll pay a premium for it – a price above the floor price set by the federal government. Bothfeld compared the demand for the milk supply to the demand for a star baseball player. "You’re going to have to pay to move that player away from that team to someone else’s team," Bothfeld said. "So this milk all had a home and now there are new processors that want milk and they have to get it away from someone else who was making another dairy product." Bothfeld said she wants to find ways to push this opportunity further. Right now dairy cooperatives collect the premiums and share the extra money equally among all their farmers. Bothfeld said one idea being discussed is directing premiums to the specific farms that produce milk with a higher protein content, something Greek yogurt makers want. As Bothfeld said, "The farmer had to change some feeding practices and management to get that extra protein. Is there a direct payment for that?" This spring the milk supply has increased and the price paid to farmers has dropped. But back at Commonwealth Dairy, President Tom Moffit said he has persistent concerns about the future milk supply. He pointed to a machine that’s pumping Greek yogurt nonstop and said, "This filler is making 90 cups a minute of two-pound cups of Greek yogurt, so its using about 630 pounds of milk a minute. That’s a lot of milk!" Moffitt says he doesn’t see an end to the demand for Greek yogurt. Or the milk that’s needed to make it. A Brattleboro yogurt company that’s been operating less than two years says it’s grown more quickly than expected. That’s thanks to the rising popularity of Greek-style yogurt, which the company makes. A startup company that plans to produce yogurt in Brattleboro has won approval from the town’s Development Review Board. Commonwealth Yogurt is expected to bring jobs – and a new milk market – to the area.